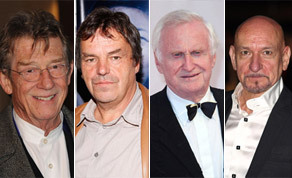 John Boorman and Neil Jordan are currently in pre-production with ‘Broken Dream’, a feature film written by the men in the late 1970s which is now lined up to shoot in Eastern Europe this September with both Ben Kingsley (Shutter Island) and John Hurst (V fro Vandetta) attached to the project thus far. ‘Broken Dream’ is a love story set in a futuristic world. Kieran Corrigan and John Boorman have worked together on several projects in the past including ‘The General’ and ‘The Tiger’s Tail’ and Corrigan says he has been involved with ‘Broken Dream’ since its inception during the 70’s. Oscar winning actor Ben Kingsley has signed on to star in the film whilst talks are underway for John Hurt to also appear. Further cast and crew members are yet to be confirmed with an eight week shoot expected to commence in September in Eastern Europe, though Kieran also hopes to shoot some of the feature in Ireland, citing Wicklow as a possible location. He tells us that the film will post in Ireland but cannot confirm yet which Irish post house will be used.